Panasonic has unveiled the LUMIX GH5S, a new addition to the G Series lineup with exceptional low-light performance for the professional videographer. The GH5S will be available in Australia in February 2018. A companion model to the highly successful DC-GH5 hybrid digital single lens mirrorless camera, the GH5S incorporates a 10.2-megapixel Digital Live MOS Sensor and Venus Engine with – in a first for LUMIX – Dual Native ISO technology delivering a maximum ISO of 51200. “Dual Native ISO was originally developed for Panasonic’s Varicam broadcast cameras. This capability has received critical acclaim from professional cinematographers who need to work creatively in challenging lighting conditions without compromise. The GH5S offers a number of other capabilities that video specialists will appreciate. A slightly larger multi-aspect sensor provides sufficient margin to allow all aspect ratios to have the same angle of view – including Cinema 4K; 4K; Anamorphic 4:3 in video recording; and 4:3, 16:9 and 3:2 in photo shooting. For situations where extreme slow-motion is required, the variable frame rate has been increased to up to 240 frames per second (fps) in Full HD (maximum 10x slower); and the GH5S also records overcranked / undercranked video in C4K/4K (60 fps, maximum 2.5x slower)i. Other convenient features include V-Log L profile and LUT (Look Up Table) pre-installed in the camera, so users can immediately play videos recorded in V-Log L. The GH5S is also at home in the studio interfacing with other broadcast cameras thanks to its compatibility with Time Code IN/OUT. This is easy to set up using the flash sync terminal and bundled BNC converter cable. The GH5S is further optimised to provide excellent autofocus in low-light environments, with -5EV luminance detection in Low Light AF. Live View Boost allows scenes to be electronically illuminated in almost total darkness to check accuracy in Live View before shooting; and to support this, the magnification ratio in MF Assist has been increased to 20x. Night Mode – which aids the photographer’s night vision – can be selected to put a red cast over the viewfinder and/or the LCD display. Other key features include 4K 10-bit 4:2:2 25/30p video recording to SD Cardii and 4K quality video at 50/60 fps in Cinema 4K (4096 x 2160)iii. The GH5S is built for the professional, incorporating a weather-sealed body, large-capacity batteries, dual UHS-II SD Card slots and convenient Bluetooth and Wi-fi connectivity. The DC-GH5S will be available in Australia in February 2018 from photographic specialists and consumer electronics retailers. Dual Native ISO is a technology that seamlessly bridges two separate native ISO circuits, and is used in Panasonic’s professional Varicam cameras. In the GH5S, Dual Native ISO minimises noise generation by choosing the optimal circuit to use according to the sensitivity before gain processing. As a result, it allows a maximum ISO 51200 high sensitivity recording. Dual Native ISO can be switched manually between LOW (ISO160-800/Native 400) and HIGH (ISO800-51200/Native 2500). The GH5S incorporates 400-Mbps 4:2:2 10-bit All-Intra video recording in 4K 30p/25p/24p and 200-Mbps All-Intra in Full-HD; 4K video recording in Anamorphic mode; 4K Hybrid Log Gamma Profile compatible with 4K HDR television; and USB tethering. Contrast AF with DFDiv (Depth From Defocus) technology allows the GH5S to achieve fast AF of 0.07 secv (approx.). In high-speed burst shooting the camera captures 12 fps (AFS)/ 8 (AFC) in 12-bit RAW and 11 fps (AFS) / 7 (AFC) in 14-bit RAW. The camera also incorporates 4K Photo, capturing 60 fps in 8-megapixel resolution. For amazingly precise focusing, users can create a group of 225 focus areas and move or change it in size according to the composition. Panasonic also offers Face/Eye Recognition, Tracking AF, 1-area AF and Pinpoint AF. The DC-GH5S has a magnesium alloy full diecast front/rear frame. Secure construction and sealing for every joint, dial, and button ensure the camera is not only splashvi and dust-proof but also freeze-proof down to -10 degrees Celsius. The DC-GH5S offers dual SD Memory Card slots, compatible with high-speed, high capacity UHS-II and Video Speed Class V60/V90. Users can select Relay Recording, Backup Recording or Allocation Recording modes. The OLED Live View Finder (3,680K-dot) ensures precise focus with a stunning magnification of 0.76x (35mm camera equivalent), 100% field of view and a smooth 120fps display. In addition to dual dials, an omni-directional joystick enables intuitive and flexible operation. Field work is streamlined with Bluetooth 4.2 Low Energy connection and secure 5GHz Wi-Fi® (IEEE 802.11ac), providing convenient remote control and sharing with other devices, and faster data transmission. 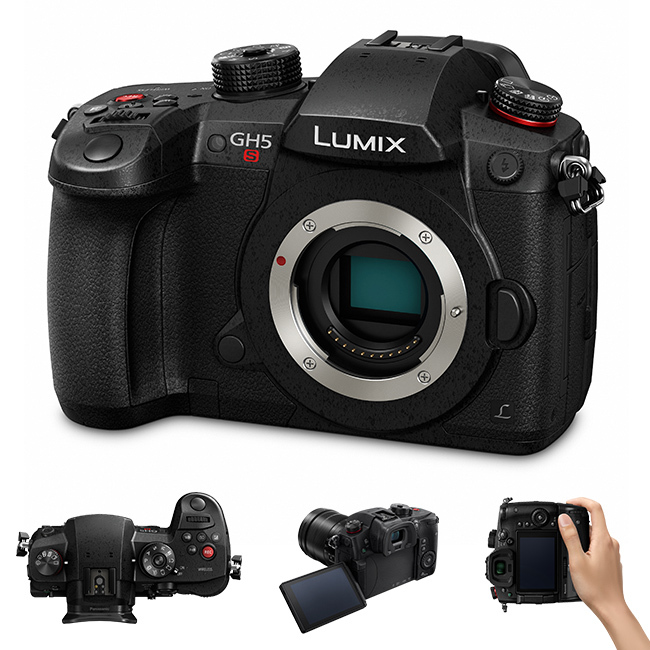 For further information on the DC-GH5S, please visit www.panasonic.com.au or call 132 600. Watch all videos on Panasonic Australia YouTube Channel. i In 24p playback. Effect value varies depending on the recording format and frequency. The angle of view narrows when a frame rate of 204 or more is selected. ii 4:2:0 8-bit in C4K 60p/50p and 4K 60p/50p recording on an SD Memory Card. iv Contrast AF with DFD Technology works only with Panasonic Micro Four Thirds lenses. v In AFS, at wide-end with H-ES12060 (CIPA). vi Splash Proof is a term used to describe an extra level of protection the GH5S offers against exposure to a minimal amount of moisture, water or dust. Splash Proof does not guarantee that damage will not occur if this camera is subjected to direct contact with water. Camcorder range delivers outstanding imaging and ultra-smooth shooting – incorporating 4K, large sensor, LEICA 24x optical zoom, and new stabilisation system. 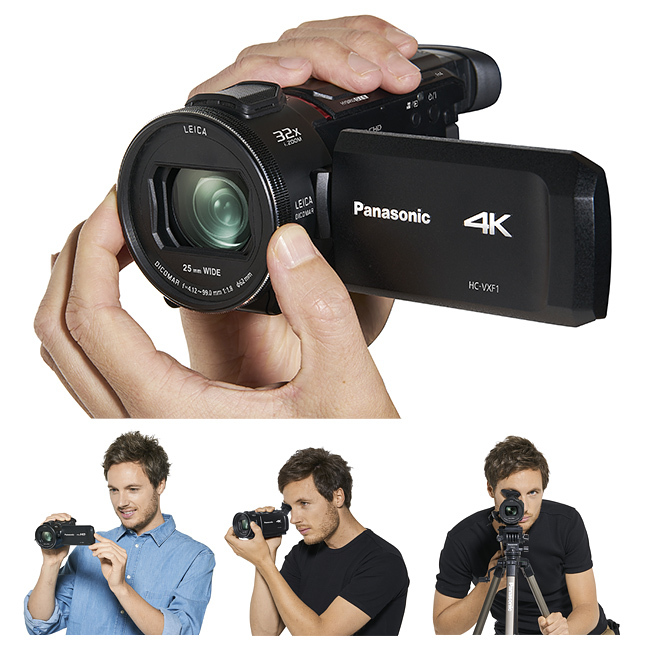 Panasonic Australia has announced four new camcorders designed to inspire. The new 4K and Full HD models feature excellent low-light performance delivered by a large back-illuminated MOS sensor; a high-performance LEICA lens with a bright F1.8 aperture and 24x optical zoom; plus a newly-designed ultra-smooth optical image stabilisation system incorporating ‘Ball O.I.S’ and ‘Adaptive O.I.S’. The new sensor ensures low-light scenes are vivid and true-to-life; and the powerful 24x zoom combined with advanced stabilisation provides amazing versatility and shake-free performance. Now you can truly take advantage of every opportunity – from atmospheric night footage to wide angle shooting and getting right up close to the action. The new Panasonic camcorders have an attractive and ergonomic design. The lens barrel is housed in a circular chassis, and the body has a stylish textured look. The HC-WXF1M and HC-VXF1 models also offer a manual ring at the front of the body to fine tune focus, iris and zoom; and a tiltable viewfinder for accurate framing. The new large back-illuminated MOS sensor, combined with the bright F1.8 LEICA lens, provides excellent low-light shooting in situations from dimly lit indoor party scenes to outdoor events. When shooting in 4K, low-light performance is improved by around 70% compared to the previous Panasonic 4K models. The new LEICA lens has a powerful 24x optical zoom that ranges from 25mm wide angle to 600mm telephoto. The stunning wide-angle capability makes it easy to fit large groups into the frame, and is also convenient for recording selfies with the rotatable LCD. A 4-Drive lens system drives the four lens groups independently, and achieves high zoom in a compact body. Panasonic’s latest camcorders offer 5-Axis HYBRID O.I.S. + which now incorporates the ‘Ball O.I.S. System’ and ‘Adaptive O.I.S’. This maximises the shooting capabilities of the 24x zoom lens, further reducing blur caused by hand-shake and ensuring smooth movement and clear, sharp images even at full zoom. In addition, the Level Shot function automatically detects and corrects tilt. The new Panasonic 4K camcorders offer 4K Video, 4K Cropping and 4K Photo modes, allowing even the novice user to create polished videos and amazing stills. 4K Cropping takes advantage of the stunning quality of 4K, allowing the user to edit in-camera after shooting, select the best angles and achieve smooth panning and zooming, while still retaining Full HD resolution and crisp detail. When recording in 4K Photo mode, the camcorders can capture 8-megapixel still images of decisive moments, shot at an incredible 30 frames per second. Wi-Fi and Wireless Multi Cam can connect up to three smart devices to record two additional perspectives simultaneously. Cinema-like effects allow users to apply creative techniques to videos such as Slow & Quick Video, Slow Zoom, Slow Motion Video and Dolly Zoom. The new Panasonic camcorders will be available from photo specialists and consumer electronics retailers. For further information please visit www.panasonic.com.au or call 132 600. The Panasonic kitchen staff every cook needs! Panasonic Australia. Copyright © 2016.